And engaged them with right goodwill. I’ll never play golf any more. In my bedroom by candle light. My nerve, my strength, and my fancied skill, . Get a shock beyond recall. Going the round in "fours" and “fives,"
Till the eighteen holes were done. Is golf—and I’ll play no more. And in "two" lay close to the hole. And never play golf any more! Were bitten and hot as fire. And hoarsely yelled out "Fore!" I have plunged through the wild morass. And few of those balls have I ever found. At golf—I’ll never play more. And the heads have gone up to the moon. But I’ll never play golf any more. To the greens and the glades I have murmured "Adieu! And replaced all the turf I could. Just to try the old game once more! 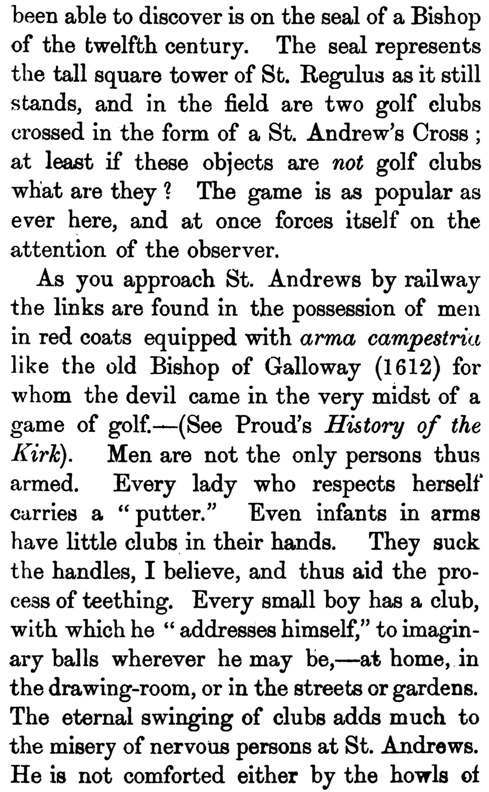 Golf is an amusement said to be peculiar to Scotland. In Edinburgh, it has been a favourite pastime from time immemorial. 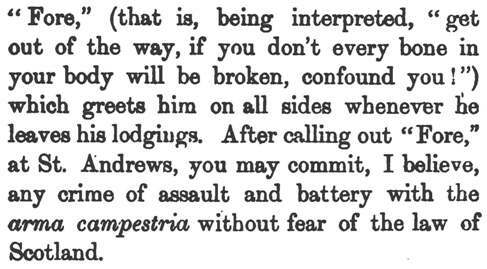 By a statute of King James II., it was prohibited that it might not interfere with the "weapon ..shawings.” These were assemblies of the populace in military array and properly armed, which were organised by the Sheriff of every county at least twice in the year. Golf is commonly played on rugged ground covered with short grass upon the seashore, called Links. This popular pastime is usually played by parties of one or more on each side. Each person provides himself with balls and a set of clubs. The ball is extremely hard, and about the size of a tennis ball. The club with which the ball is usually struck is slender and elastic, crooked at the end, which is faced with horn, and headed with lead to render it heavy. Small holes are made in the ground at the distance of about a quarter of a mile from each other, and in such a direction as to encompass the whole field. The game is won by the party who lodges his balls in the different holes in succession with the fewest strokes. The art of the game consists, first, at the outset, in striking the ball to a great distance and in a proper direction so that it may rest upon smooth ground; secondly, and this is of the greatest importance, when near the hole so to proportionate the force and direction of the stroke, or putting, as it is called, that the ball may with a few strokes be driven into the hole. 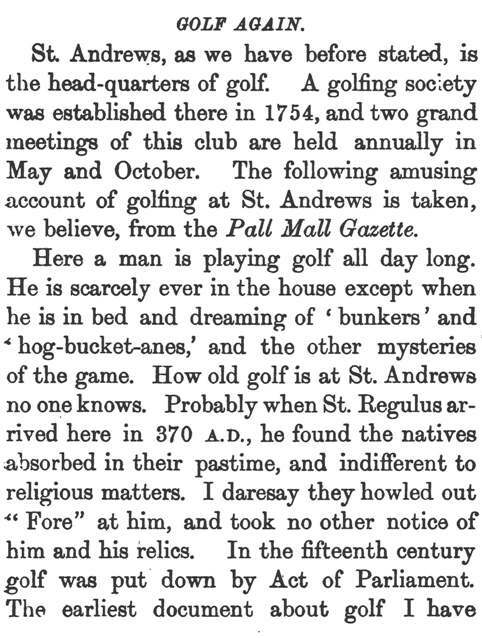 Golf is a Scottish game of great antiquity. Although prohibited by James II., it was a popular pastime in the reign of James VI., who practised it himself while at Dunfermline, and introduced it afterwards at Blackheath, in Kent. During his residence in Scotland, in 1641, Charles I. played golf on the links at Leith. His royal brother, James VII., was also devoted to this national sport. The headquarters of golf is at St. Andrews; and the rules authorised by its club are adopted by all the other golfing societies throughout the country.